So, since I made these for some family members, I have no one that I can show them to in person, and I think they turned out really nicely. They're egg-shaped, lavender-infused soap. I followed directions from another website. I'll link to that site in a bit. I had some problems but was able to mitigate them, and I found I didn't need everything the site advised. I'll share all of that. But first, some background. You all know that my budget is small right now. Easter is going to have to be pulled off with the only spending going for a ham. I have always given gifts to family members for Easter, and I don't want to stop this year. So, I am using what I have, which is not only a great thing for our budget, but it also creates less waste and gasoline usage (good for the environment). For all of these reasons, I absolutely love using what I have. I have always been motivated equally by financial savings and by wasting less. Waste just bugs me. Anyway, back to the gift. You may or may not recall that I have done some melt-and-pour soap making in years past. A couple of years ago I posted about making bars of soap for Christmas and birthday gifts. You know how it is with crafting -- there are always leftover supplies. In thinking about gifts that I could make, I once again went to my crafting cupboard. When I came across the soap-making supplies, I was reminded of some beautiful egg-shaped soaps that I have seen in specialty shops. Oooh, I've really loved/coveted those. While I would love to have some for myself, I think I would love even more to give these to someone in my life. 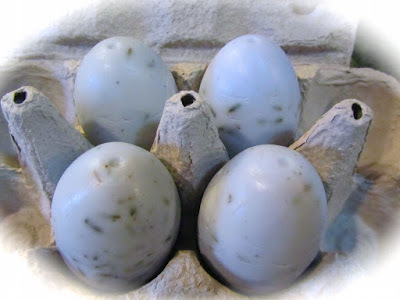 With this beginning idea in mind, I set out to see how I could make my own egg-shaped soaps, using only what I have at home. And that's when I came across this post on My Repurposed Life. 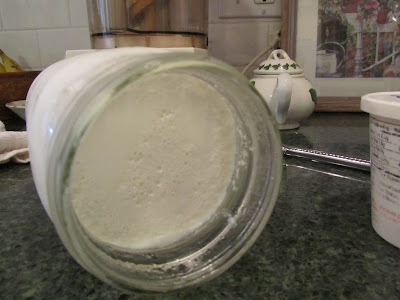 You have to check this out, even if you don't want to make soap. The woman's soap and packaging ideas are simply beautiful. I plan on using some of her packaging ideas for my own soaps. Anyway, I had the melt-and-pour soap base, lavender essential oil, lavender buds, blue and red soap coloring, and some plastic Easter eggs. I was all set! Saturday afternoon, both daughters were out for a few hours, so I could work privately in the kitchen. As suggested by the website post, I used plastic Easter eggs for my molds (I made 2 molds). I drilled out a pouring hole in the non-pointed end of the egg, beginning with the smallest bit on our drill and working my way up to the largest bit we have. I ended up with a hole slightly bigger than 1/4-inch. Now that sounds tiny. However, with a very steady hand, it's possible to pour a thin stream of melted soup that has some clogging, but which is easily managed. My first snag was I did not have a small funnel. When I tried to improvise a funnel as the post's author had, mine just clogged with the soap and made a mess. So, I went with my steady hand for pouring a thin stream. I poured from a measuring cup with my right hand while holding a bamboo skewer in my left hand to unclog the hole, as needed. Although this took some time, it all worked out. I occasionally reheated the soap in the microwave to keep it at a pouring consistency. 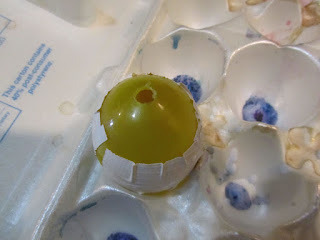 The other issue that I had was that every single soap-egg had some sort of air pocket that needed filling in after I removed the soap from the plastic egg. This was not too huge of a problem. I was able to spoon a little melted soap into any air pockets, flatten into place with the plastic egg, then use a paring knife to very gently trim edges, then buff with a microfiber cloth. 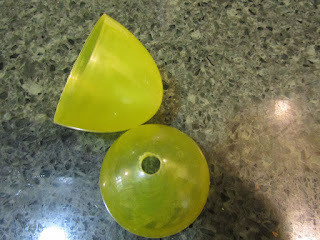 In addition, the plastic eggs that I used left a noticeable seam all around the soaps. For the seam, I used a very fine paring knife to trim it a bit, and then buffed with the microfiber cloth as I had with the fills. Something else that I think is important to the finished product -- If you look inside plastic Easter eggs, some have small protrusions inside of the egg. Others have a "Made in China" (or other country) raised marking in the egg. And still some eggs have ventilation holes. So, it was important to find eggs that were mostly smooth inside and without holes. The eggs are not perfect, but I believe that they are beautiful for a homemade gift to a family member. This was my first experience with a 3-D mold. I'll read up and experiment some more in the future. For all other soap, I've used a shallow mold that creates a bar that has a finished side and an unfinished side. There may be some tricks to filling the entire mold without creating air pockets. After making the little soaps, the plastic eggs went back into our collection of Easter eggs. The hole in one end won't harm the ability to be used in egg hunts in years to come. Can you tell that I really love Easter? It's by far my favorite holiday, from the significance of the spiritual meaning of the day, to the family meal and gift-giving, it's a day that I look forward to all year. I can hardly wait to give these as gifts. Love it! 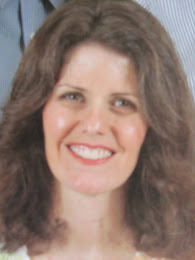 You're family is very blessed to have you - perhaps you need another daughter, i'm available for adoption - haha. Thank you, Shelby. I'll let you know if an opening ever comes up! These look fantastic! I would love to receive a present like this. Great job! When one uses just what's available to tem, that's when the real creativity comes out. You have shown us that again and again. I wonder, with your daughter's very fair skin, do they have any problems with the soaps they use. I, too, am a redhead as are all of my sisters and we can only use a couple kinds of soap. My daughters don't have a problem with any type of soap on their bodies or hands, so this is intended as a bath or hand soap for them. Is your skin so sensitive that you need a special soap for hands, as well? My skin is dry, now, so I can't use commercial liquid hand soaps, which means that when I'm away from home I have to be very careful to only use a tiny amount of whatever soap is available, and moisturize, moisturize, moisturize. 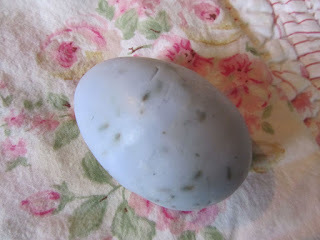 The egg shaped soaps look so adorable as a decor, not just at Easter. I hope your daughters will keep it forever. I still have chocolate wrapped candies in a floral arrangement from over 10 years ago. Not planning to ever eat it, of course, and so far no bugs either. Now that's discipline. I don't think any chocolate, no matter how beautiful, could be saved by me!